So when I selfishly want eat more of the cake than I need, I am greedy. When I excessively desire more success than anyone else that is greed. I may look successful, but I am really greedy. 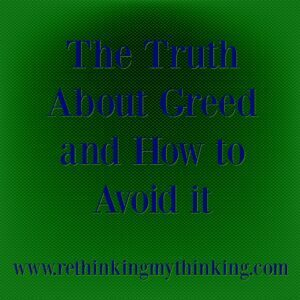 Are we brave enough to ask God to show us if we are harboring greed in our hearts? Are we willing to let go of the things we desire excessively and selfishly? Do we need to let go of a dream that we are chasing excessively and selfishly? Do we need a new measuring stick? One that helps us appropriately measure needs and excesses? Or perhaps we just need to learn to trust God? Trust God with our dreams of success so we do not excessively chase success. Trust God with our financial needs whether they be many or few so we do not selfishly hoard the money God gives us. Delight in God’s provision of salvation, trusting Him to fulfill a dream of success even if it looks different from our original dream. Delight in God’s financial provision understanding that all we have comes from Him, it is just on loan from Him that we may use it to honor Him. When we trust and delight in God, He changes our hearts. His desires become our desires, we can not cling to greed when we trust God and delight in Him. Greed loses its grip and its deception as we delight in God. Father too often I am unaware of the greed lurking in my heart. Forgive me for wanting more than I need. Help me to instead trust Your provision and delight in all the things you have done and given me. May I no longer languish in the deception of greed. Help me to delight in You at all times so that greed cannot deceive me. in Jesus’ Name I pray, Amen. I will post this, “And how do I measure excess? How do I measure “more than needed?”” on my office wall. I’m going to chew on this for a LONG time.